Daena Sethna, a client in Mumbai, India, hosted me for the month of January 2016. She had been so moved by the work I had done with her dog Gypsy over the prior two years that she wanted to share the experience with her friends, family, and community. So she flew me to Mumbai and I spent a month there teaching courses, doing private in-person consultations, and pro-bono work for two street dog rescues and an animal sanctuary. It was an incredible experience for everyone—for Daena, the animals, their people, my students, and for me too. One of the street dog rescues, Animals Matter To Me, was an especially beautiful place. Beautiful in the sense of the clarity of their mission and the above-and-beyond compassion all of the employees there have for the animals that come into their care. The founder, Ganesh, and veterinarian, Ankita, welcomed the opportunity to have me translate for some of the animals who were experiencing intense emotional or physical suffering. One communication touched me very deeply. It was with a street dog named Raja. Yet before I even introduced myself to him, he was staring at me, already communicating with me. He had been brought to the shelter two weeks prior, by some very poor women from across Mumbai. The women said he had been beaten by a man with a bamboo pole who came into their lane late at night. Upon finding him the next morning, the women were devastated by what had happened. Raja fiercely protected the women and children in this lane. And they loved him. Though he was a street dog, and his people desperately poor, he was a valued member of their neighborhood. 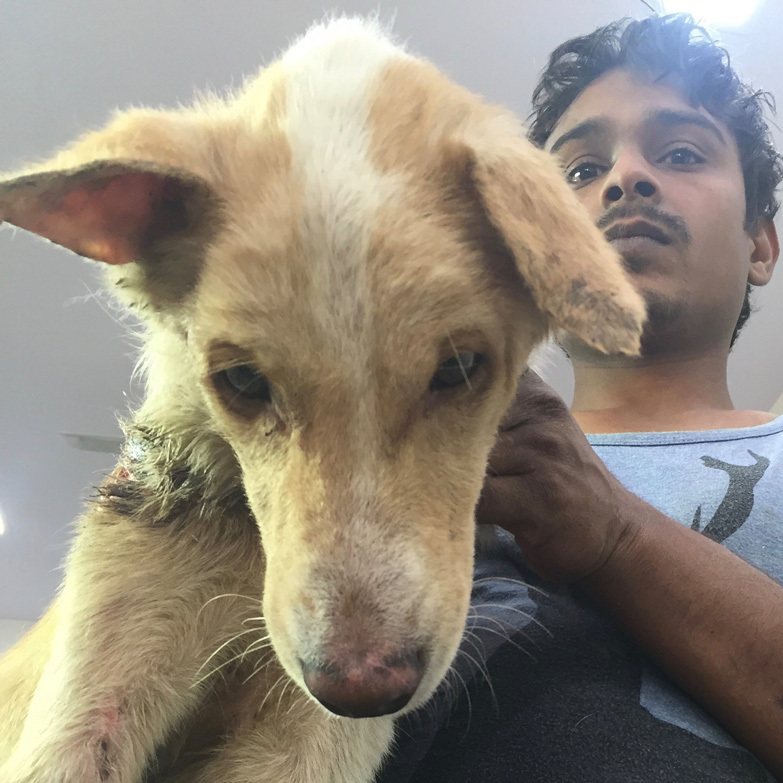 The women all pitched in and somehow found enough money to have Raja transported all the way across town to Animals Matter To Me (AMTM), a shelter where he could be given the medical care he needed and the chance to recover and return to his life. How do we help Raja? Ankita, the veterinarian at Animals Matter To Me, was grateful to have me there to translate for Raja. She hadn’t shared this with me yet, but he was a mystery to them. He seemed too far gone to rehabilitate, but he would not give up. He responded to their care as enthusiastically as his limp body would allow him. They could sense that he was not ready to let go of this life. They just couldn’t bring themselves to euthanize him. Ankita wanted to know about his health: How are you feeling? Physically and emotionally, both. What do you want? How can we help you heal faster? And please tell him that he will be sterilized while here—how does he feel about that? I asked her how long he will need to stay there, she replied at least another month. I couldn’t believe that Raja was saying this, when he couldn’t even walk, and could barely lift his head. Then Raja showed me more about the man who had beaten him, a sense of mental instability, rage, and the smell of alcohol. Ankita confirmed that Raja’s attacker was often drunk. The women had told her this. She added that there was a particular family with a small boy that Raja played with and was especially protective of. This drunk man who attacked Raja would come in the evening to visit that boy. I must have looked at the veterinarian with suspicion, because then Ankita confirmed that yes, this man’s intentions seemed questionable. But for some reason, the people didn’t prevent him from coming to visit the little boy. And Raja was always very insistent on guarding this little boy, Ankita said. I had to stop for a moment. Feeling this dog’s message to his caretakers, I literally felt my heart become warm as I empathically experienced the love, the will, and the devotion motivating him. It was as if he loved the man who beat him as much as he loved the little boy. Raja continued, “I am brave. I want to stand in between and protect the weak. This is where I get my pride, my will. This is who I am. I love and protect those who are weak.” And then Raja showed me images from his life around the neighborhood, of seeing this man before, and a knowing that the man could be violent toward weaker beings. Raja had been watching him. “This man has a hard heart. I want to teach him, This is a very important job.” Raja was insistent. I stayed with this part of his conversation for a moment, and asked Raja, “How will you teach him?” Raja showed me a nobility in his own spirit, and a sense that by defending the weak, the man would understand the boundary, and somehow understand that his behavior was wrong. Then he showed me how all the workers there have so much compassion in their hearts, a sense of warmth and caring shining out from the center of their chest, and their whole being. Raja said he was so grateful for their care. Ankita smiled and confirmed, he ate all the chicken and left some of the rice behind when they fed him. He showed me the damage that had been done to his back and exactly where it was most affected. And I could feel and see fractures in his spine. And his left back leg was numb he said, while the right leg was more alive—specifically the nerves in each leg. I felt that if Ankita acupunctured certain points in his leg it could possibly help him regain some function again in his legs. She agreed and confirmed that she does do acupuncture for the animals there, and had done some for him. And he telepathically showed me a snarl. Raja never made it back to his neighborhood to see his friend, the little boy, or to teach his attacker about respect and love. A few months after I translated for Raja in Mumbai, I received an email from Ankita. She said the women from the village stopped coming to visit Raja after about a month, and shortly after he passed away. This was hard to hear, and still hurts. I take comfort knowing that Raja had a chance to recover, that he felt compassion from his people and the staff at AMTM, and that his nobility of spirit was fully seen by those who heard his message the day of our conversation.